The Knapkes hiking last May in the Rocky Mountains. 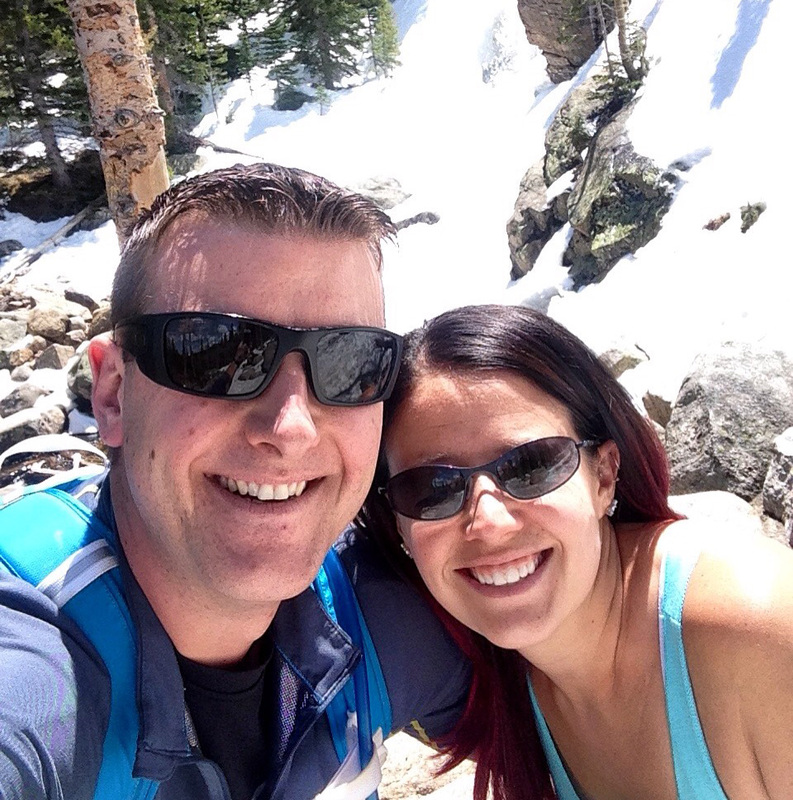 Heather and Tyson Knapke were like a lot of young couples starting out: they were in debt. One household expense on their credit cards loomed larger than all the others: at least $1,000 every month for groceries and dining out. Some weeks, the Denver-area couple could be found at their various favorite restaurants Thursday night straight through Sunday night. The food budget “was astronomical, and I had no idea,” Heather said. Their lives changed dramatically after realizing about 2 1/2 years ago that their finances were spinning out of control. How this couple transformed their debt-laden household into one that is free of credit card and college debts and has a tidy emergency fund, with retirement saving now well under way, could be a blueprint for other Millennials in the new year. Here is the order in which the Knapke’s accomplished this: reduce expenses, impose a budget, pay down debt, and start saving for retirement. “I’m trying to get ahold of my finances early – earlier than most people – so compound interest works in my favor so I’m set when I’m older. That’s the goal,” said Tyson, who is 32. How did the couple get into trouble in the first place? Before marrying, Heather, a 33-year-old hairdresser, had learned a few things about controlling expenses as she purchased shampoos and hair dyes for her clients. Her personal finances were, as a result, in decent shape. Then she fell in love with a man in debt. Tyson had graduated from the University of Colorado with a communications degree, $16,000 in student loans, and another $9,000 distributed among three credit cards. One tough financial decision – the first of many – came after Tyson landed his first big job, as a digital marketing specialist for a travel company. They moved in with his parents for nine months so they could pay down some debt, cut their expenses, and prepare to purchase their first house. “We had to get out of that red scenario,” said Heather. As planned, they paid off the cards and, in 2008, moved into a starter home and married later that year. They lived well on a lifestyle funded by their dual incomes, regularly saying yes to sweet deals on the travel packages – London, Paris, Ireland, Italy, a river cruise in Holland – that Tyson had access to in his new job. The couple again resolved to get serious about their finances after upgrading to a larger home in Littleton, Colo., in February 2014. Now, the stakes were higher: their mortgage payment was draining $2,400 of their cash flow every month, making it difficult to cover the student loans and car payment. On top of that, they’d built up $6,000 on their credit cards for a moving van and to pay for painting the house, cleaning the carpets, fixing the garage door, and buying a new washer and dryer and living room and bedroom furniture. “The budget forces you to live below your means,” Tyson said. Discipline also got them where they wanted to be financially. After a decade of payments, the student loans disappeared last year. The couple has $20,000 in a savings account, and the value of their home has increased by $100,000. Tyson initially put 5 percent of his pay into his 401(k) but recently doubled that to 10 percent. As their retirement fund balance grows, he pores over investment books – he’s even writing a personal finance blog for other Millennials. With their thoughts oriented toward the future, the Knapkes are anticipating another major expense: their first baby is due in March. “We’ll have to start a college account,” Heather said. Although the article is not clear at what age they were eating out four nights out of seven, it doesn’t take a degree in rocket science to correct that. These seem to be nice young folks so I don’t mean to pick on them (and I wish them all the best), but every real estate ad I read geared toward Millennials these days always seem to stress “walking distance to bars and restaurants.” Is eating out a national passion for this generation? Your thoughts? Very interesting, now the trick will be to get Millennials to read this!